The herb can add a nutrient boost to everything from pasta salad to tuna sammies. 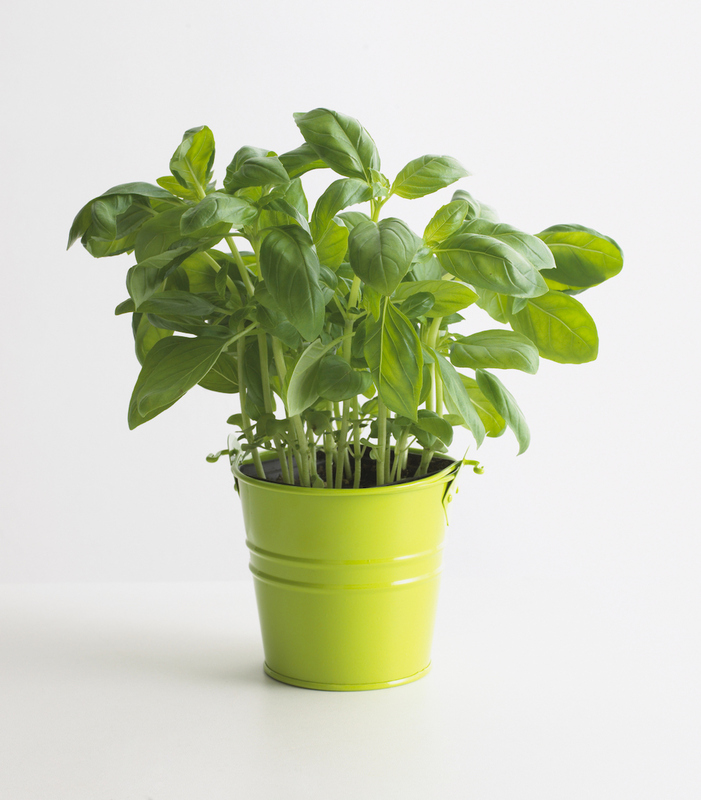 In the summer, the floral bouquet of basil is ubiquitous: in the garden; at the farmers’ market; even at the supermarket. It’s as pretty as a bunch of flowers this time of year, too, with a voluptuous heft and verdant leaves you just don’t see in winter. So you’ve got plenty of reasons to use every leaf on the bunch. Happily, there are plenty of ideas out there for how to do that. Here are a few of our favorites. Make big bunches of pesto, and freeze any you can’t use up before it goes bad with a layer of olive oil on top. Swirl pesto into pastas, on to soups, into risotto, and on top of baked salmon. If you’ve never folded fresh herbs into your, let today be the day. Fresh leaves of basil are a delight in salads, even beyond the classic. Mustard, lemon, vinegar, and shallot-based dressings all take kindly to a handful of basil leaves folded in with the other greens. You can even make a mixed-herb salad, as chef Jenn Louis suggests in her cookbook. Serve it alongside roast salmon, and dress it with oil and vinegar if you wish. Though you generally don’t want to overdo it with basil—as is true of mint, it bruises somewhat easily, which changes its flavor—you can fold it into and mocktails. Muddle it lightly for a strawberry spritzer. Add a sprig of it to lemonade. Remember that it can go in sweet and savory directions. Take the idea one step further, as the authors of do, and make a by combining two parts sugar to one part water. As it cools, add a few sprigs of basil. Once cool, strain out the herb. Use your basil simple syrup in iced teas, cocktails, or basil-strawberry lemonade. Remember that a bunch of basil tucked into the cavity of a chicken right before you roast it perfumes the whole bird. Same with you wrap in parchment; why not add basil? If you’ve never had basil ice cream or gelato, you are missing out. Think about it: cream and basil. Luxe and floral. You can see how it could work so well, and there are plenty of out there to help get you there. Another Jenn Louis idea is to add basil to fruit crisps. Strawberries are famously basil-friendly, but so are peaches, plums, nectarines, and blueberries. Add basil leaves to, France’s famous sandwich of tuna, red onions, tomatoes, and hard-boiled eggs. Tuck whole leaves into chicken-avocado or egg salad sandwiches. Jonathan Waxman’s book suggests combining roast eggplant, peppers, and zucchini with pesto for a sandwich. Most savory meats—especially Italian ones—are excellent foils for the herb, so feel free to experiment. If you haven’t had a turkey sandwich with homemade basil mayonnaise—simply chopped basil, salt and pepper swirled into mayo—I’d argue you haven’t really had a turkey sandwich. Italian (distinct from Mexico’s version) can be as simple as parsley, basil, red pepper flakes, anchovies, garlic, olive oil, salt and pepper all spun together and used to top any meat or fish. But we’re particularly taken with this version, which Waxman uses to shellac the famous roast chicken at his New York City restaurant Barbuto. Ready to ditch added sugar? Sign up for our ! Basil is a member of the mint family, so when you’re making Thai and Vietnamese food, keep it in mind—especially when you don’t have the mint the recipe calls for. Though bai horapa, “Thai basil,” is more typical, and has a more pronounced anise flavor, the more commonly available sweet basil works nicely in most of these dishes. In her book Favorite Recipes from Melissa Clark’s Kitchen, Melissa Clark calls for basil in her with lemongrass as well as her. Snipped fresh basil leaves on top of a pie are the real difference between homemade and takeout. Make every pizza gorgeous—particularly so if you can locate opal basil, with its knockout purple leaves. Fold basil into your pasta and potato salads of choice, and notice how much it brightens up the flavor. These oil and mayonnaise salads can be overwhelming without citrus and herbs to add fresh notes, so try to do both.